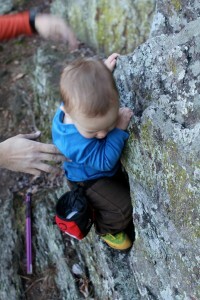 I mentioned sometime before Christmas that Cragbaby had a few key pieces of climbing gear on his list – namely a chalkbag and a pair of rock shoes! Ever since he found all of his big boy toys under the tree, C has been dying to get out and take them for a test spin. Luckily for him we’ve had spectacular weather for the majority of January, so he’s had ample opportunity to sport his new duds! 1. It has a monkey on it. 2. The drawstring is fun to cinch open and closed. 3. Whenever he pulls his hands out of the bag he leaves white marks EVERYWHERE. 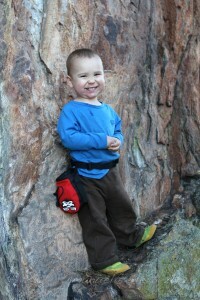 The Mad Rock Chalkbag is the perfect size for C’s itty bitty hands. We thought the most economical and environmental choice would be to fill it with a chalk ball instead of loose chalk, in light of C’s overwhelming desire to dump things out of containers. He was really excited about digging his hands around in the bag and getting chalk on his hands, especially when he saw the grown-ups chalking up. The only kind of weird part about the bag is that for some reason it keeps swiveling around to the front, but that certainly doesn’t seem to bother C.
I would definitely recommend having a chalkbag handy for your tyke on your outdoor adventures, whether they involve climbing or not. Aside from the obvious use as a chalkbag, they are equally fantastic for more creative “off-label” uses. 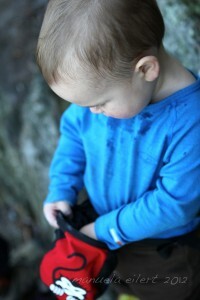 Not only can a chalkbag serve as a Nature Memento Holder for special twigs, leaves, and rocks your child finds along the way, but it can be a great place to store essentials that are still too big to keep in your child’s pocket – such as tissues or snacks. But that’s not all C’s been up to this past month – stay tuned for another gear review on one of Cragbaby’s current most prized possessions at the crag – his brand new rock shoes! That’s really cute. Our daughter has the same Mad Rock bag, and she loves it. She’s using it more for hiking and collecting things than anything else. Lately, she’s started to use it to carry other things too, like her milk or a stuffed animal or two. We need to get her a second one so we can have on that she actually keeps chalk in. My son got himself a pair of shoes (Red Chili’s) a harness (BD) and the exact same chalkbag, the Crouching Monkey Mad Rock bag. 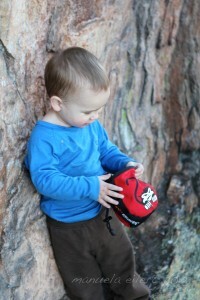 We opted for a chalk ball too and it works terrific, especially since he’s big into bouldering like his dad. It’s inexpensive and gives kids the mental edge they need. Often times our son “falls” from his “problems” that he’s working because he says he needs chalk, a little dusting and he’s good to go. The bag is cute but the climber is even CUTER!